Kungfu Kitchen is the first restaurant concept by Miro Kurvinen, 2014 Finnish Master Chef. 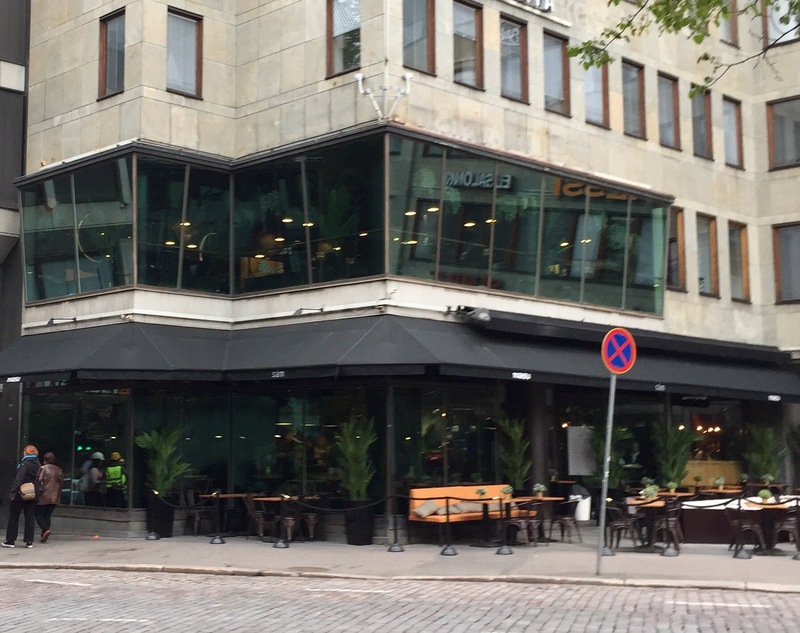 Restaurant was opened in May 2017. 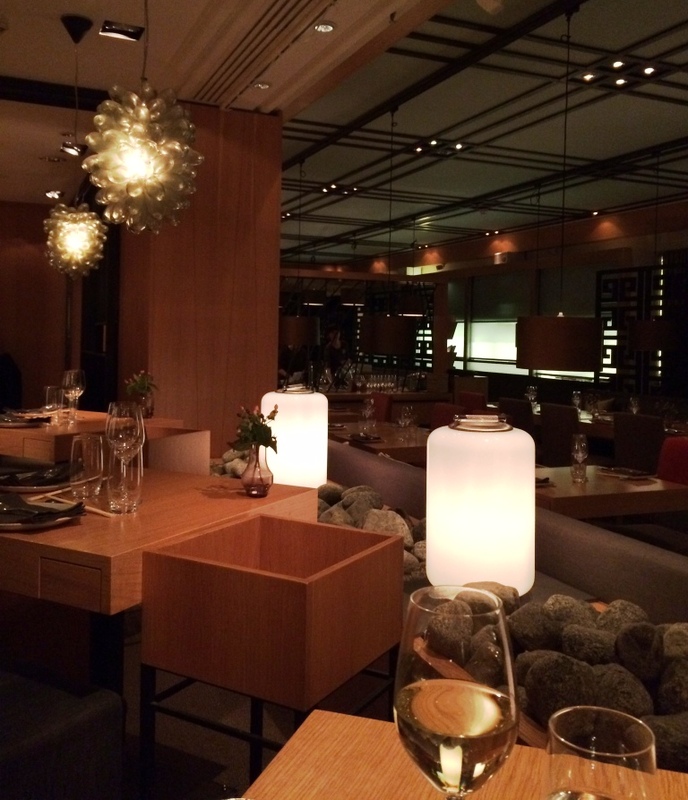 Both the food and the ambiance of the restaurant itself are straight-forward and unpretentious. 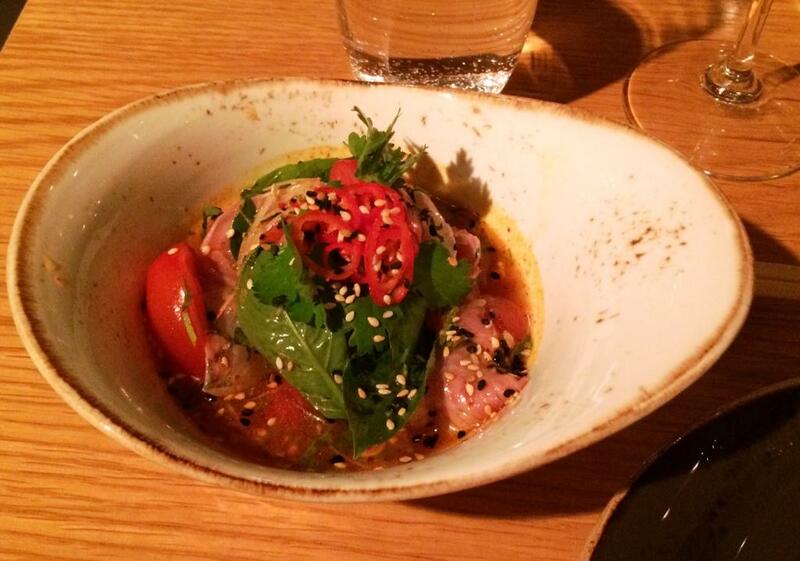 The restaurant’s food philosophy is based on a few important cornerstones: Flavor, freshness and presentation. 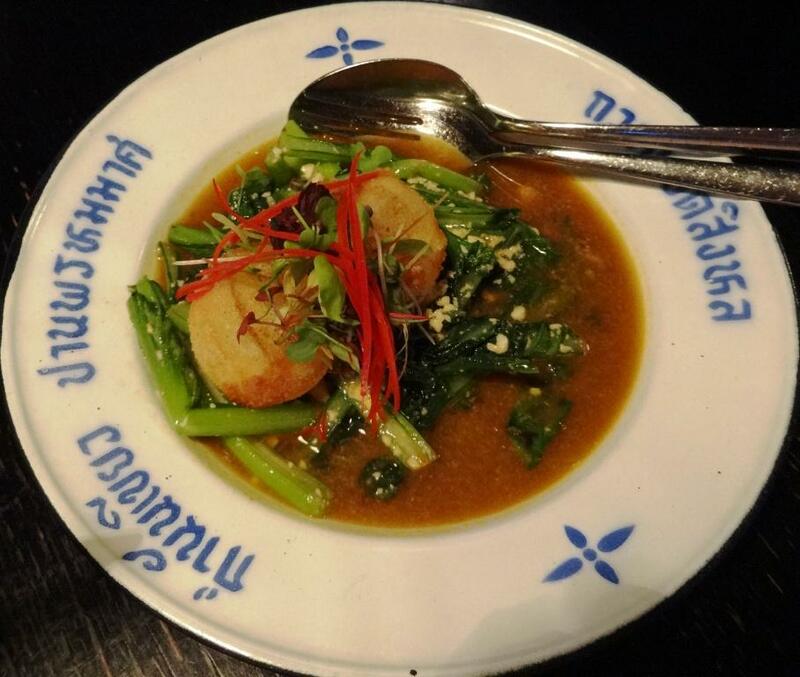 Kungfu Kitchen offers up dishes made from fresh local ingredients. 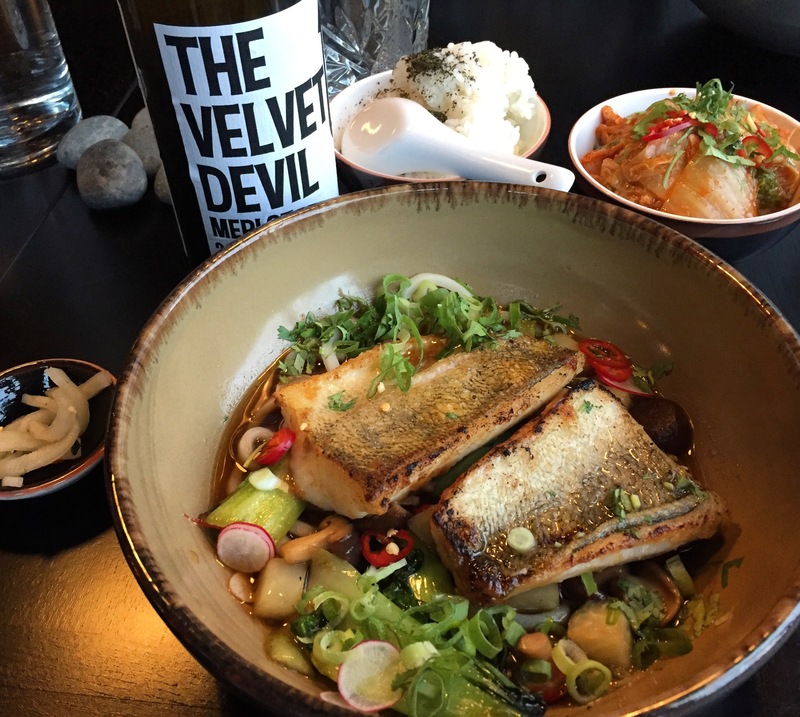 The cuisine ranges from modern classics to innovative cross-kitchen dishes and simple bar food with a relaxed Asian twist. During lunch service, the restaurant offers up a quick self-service buffet. In the evenings one can stop by for a drink and a few bar snacks. Dinner is based on a la carte list or chef’s menus. The bar itself is small just front of the dining area. 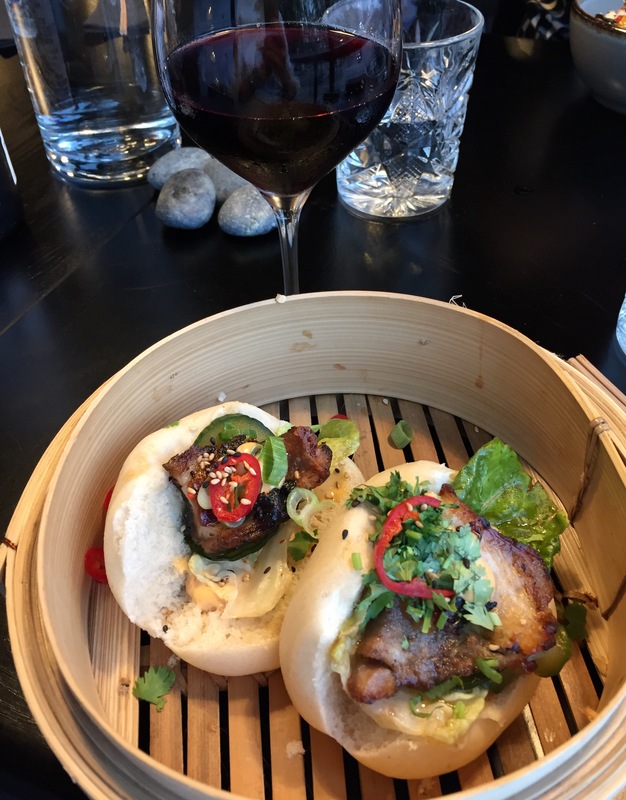 For starters ordered BAHNBAO, Soft Steamed Vietnamese buns, Crispy pork belly and Teriyaki marinated pulled oat. Pork was crispy as the name of the dish promised. Combination of spices, herbs and meat was delicious. Restaurant could offer this also as main course if there would be two buns in a basket. Pulled oat (in Finnish Nyhtökaura) is Finnish vegan innovation which has become popular since introduction. Now some restaurants have started to use it and propably it increases their attractiveness. 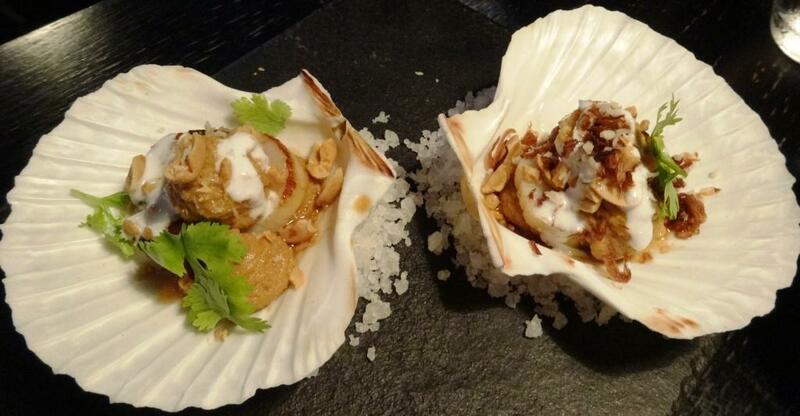 Pulled oat with teriayki was delicious and definately suitable for asian flavours. Main courses were Daily wish with lemongrass bisque and All the good stu in bowl: Fragrant jasmine rise, vegetables, fried egg with Shiitake mushrooms and tofu. Fish of the day was pike perch, delicous white meated Finnish lake fish. After bringing the fish plate to the table, waitress poured the sauce, lemongrass bisque, on top of the portion. Fish itself was perfectly grilled and with vegetables enjoyable ensemble. One can choose to bowl three different options and one is with mushrooms and tofu. 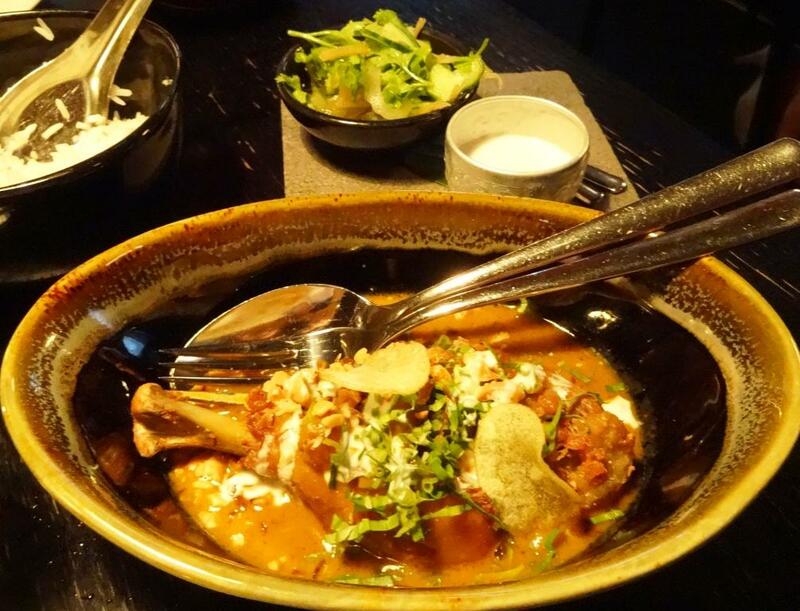 Dish was spicy and tasty, pleasant suprise especially when it comes to strongness of spices. For wine had Antonio Rubini Appassimento, Italian red wine from Apulia. Wine paired perfectly with starters and main courses and the spices used. Full-bodied with medium tannins, wine was luscious and enough spicy. And when it comes to price, affordable bottle for the quality it provided. Service is professional, only hick-up was in word fries. Tried to order them as side dish but two waitresses heard rice. So better use the whole name of the dish, Kungfu fries. And then the price of water, paid 6 euros for still water. One can explain the price with Thoreau Water which is a Swedish Design Concept for serving water that is produced locally. But as far I understand it is still tap water? 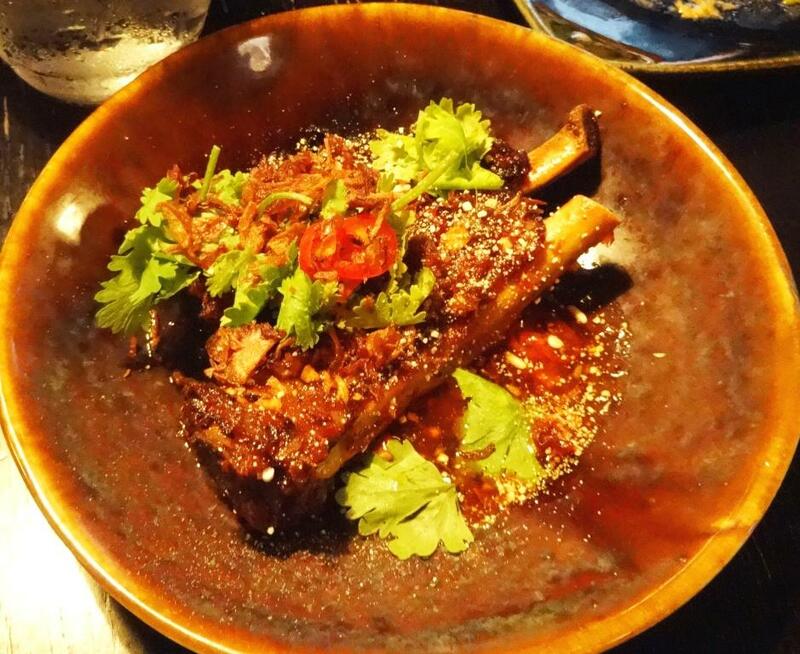 Kungfu Kitchen is excellent restaurant for Asian cuisine lovers. Food is fresh and tasty, definately a place to re-visit. It has many vegan choises which is becoming more and more popular trend. Note that restaurant is closed in January 2016 due to renovation. New Year’s Eve did not differ so much from regular evening except when it comes to menu, that was planned for special day. 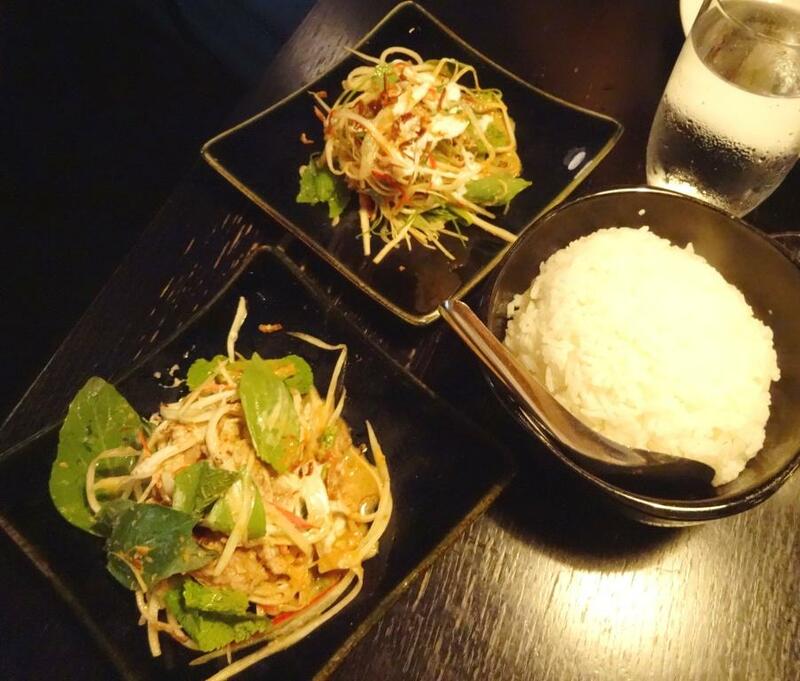 Food is always well prepared and delicious at Yume, but special menu was not that special because menus have always been enjoyable. Maybe surprise small bite between dishes would have been spectacular. 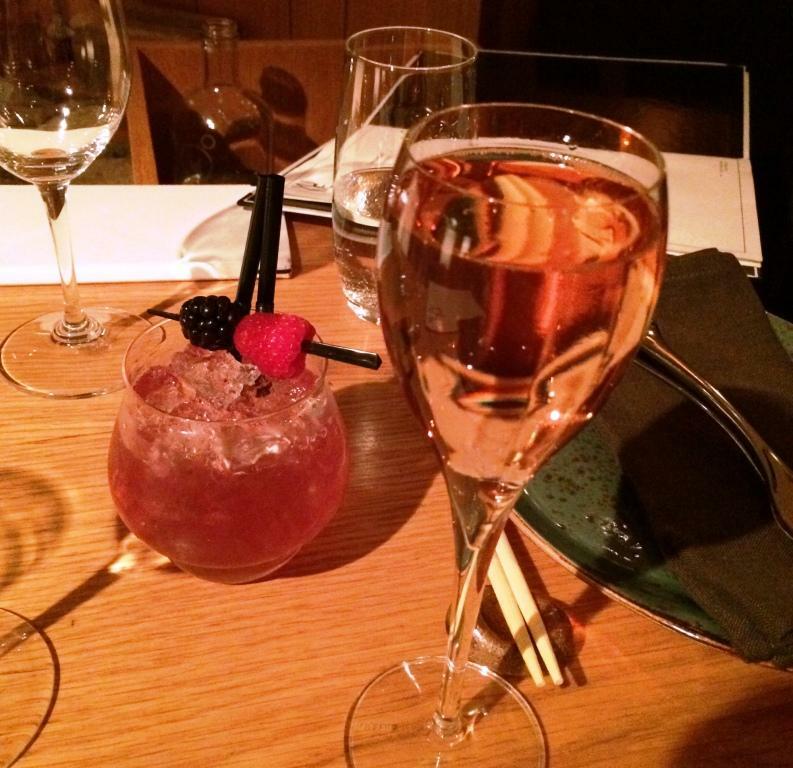 Started with aperitives, but got first two dishes 2 minutes after drinks. Those two dishes, Spiced salmon in soy sauce and Sushi pieces were first part of the dinner being both starters. But it was quite odd that restaurant served these portions while taking first sips. OK, waitress noticed that eating did not start before had enjoyed the drinks and after that it was more comfortable to eat next dishes without rush. 3rd dish was the best of all portions. Pork ribs were so delicious that could have eaten them for rest of the menu. Extremely well spiced these juicy ribs were so far the best have ever tasted. And 4th dish was Beef meat served with rice. A little bit too greasy, but with chili slices and “soup” again show case of Yume kitchen professionalism. 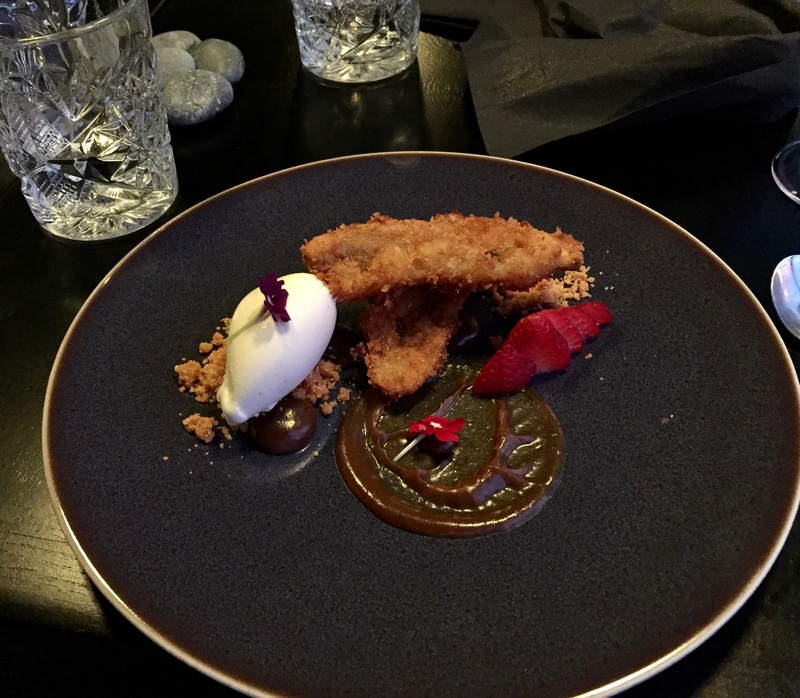 Yume can Asian-Scandinavian type desserts! Not too complicated for local taste. Means that sometimes different type of vegetables and herbs used in desserts make them almost snack or main course, not dessert. Dessert was Pudding with sorbet. Interesting detail is the location of extra cutlery. They are hidden in a small box under the table, but only on one side. 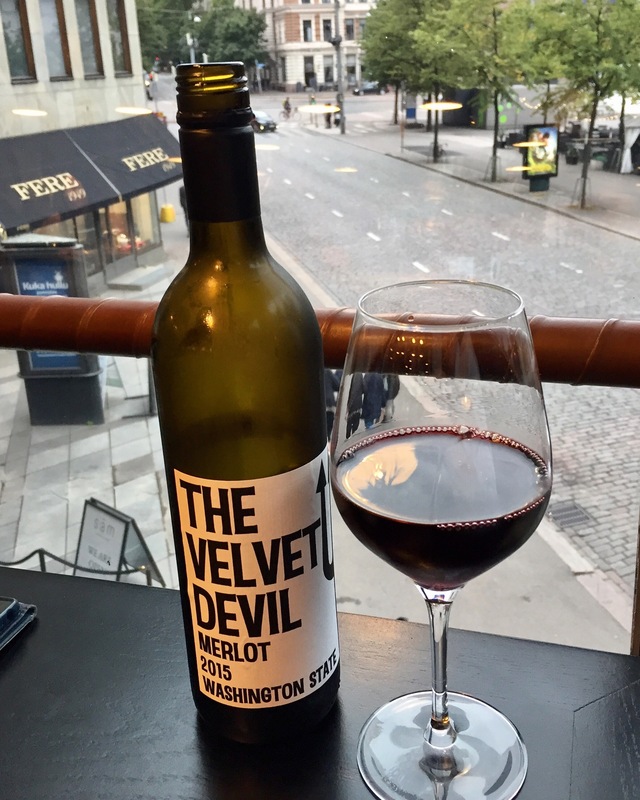 For wine chose The Velvet Devil from Charles Smith Wines, USA. 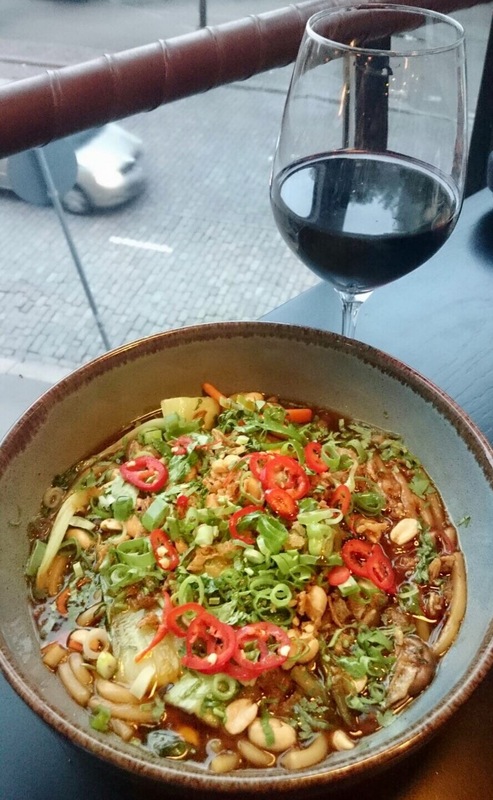 100% Merlot pairs well with spicy, almost even hot dishes. 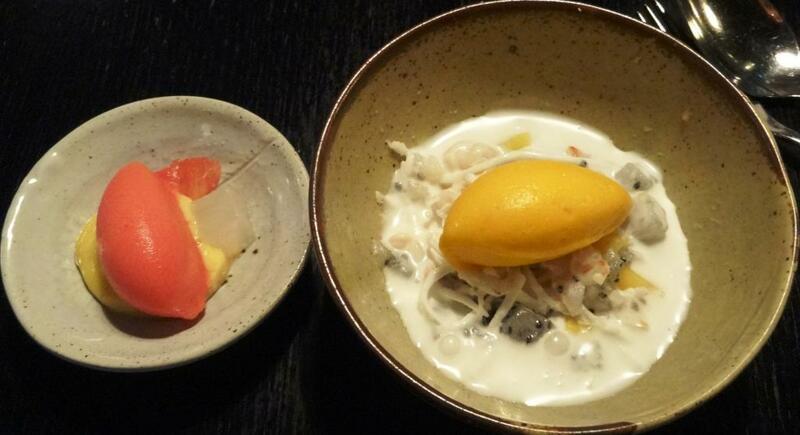 Yume is one of the best “gourmet” asian cusine restaurants in Helsinki. As it is in the center of the city, next door to Hotel Kämp, it’s location is also perfect. Modern rhythm music is not too loud and most of the tables are not thick on the ground, which makes discussion possible. Service was professional as expected and would have given 4,5, if starters would have not appear so quickly. 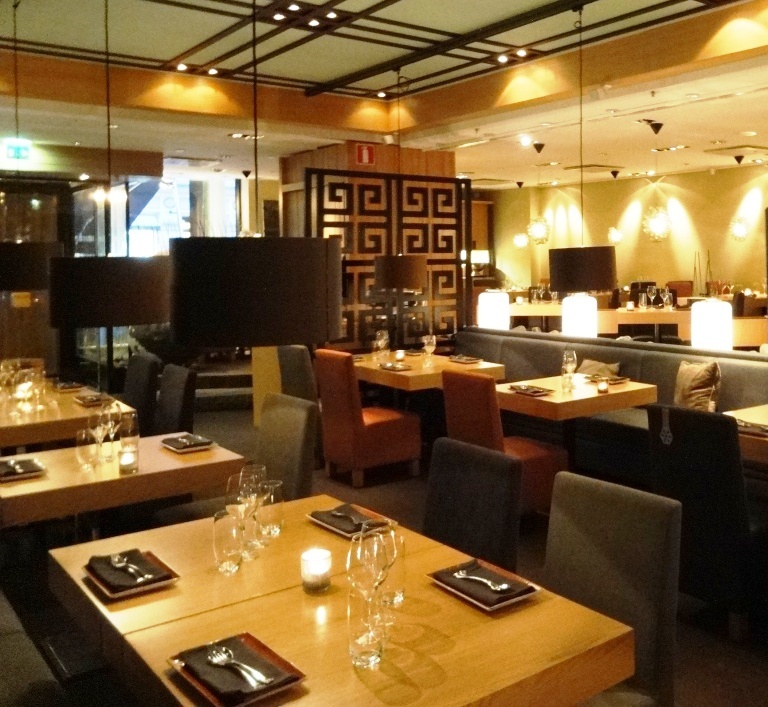 Restaurant Yume is part of Kämp Group, which also operates luxury hotel Kämp. 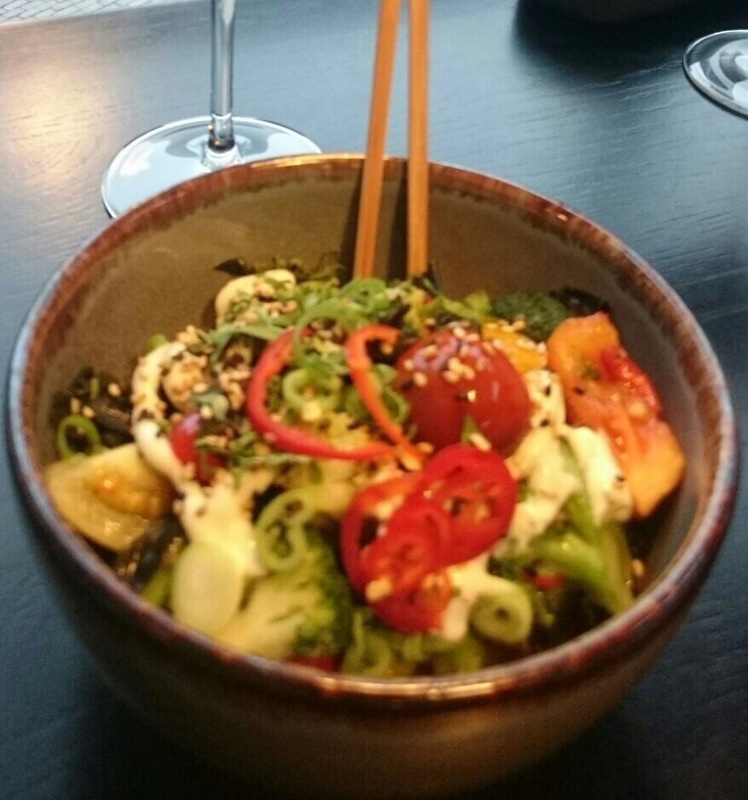 Yume serves Asian flavours in a modern decor, and is located in the same building as hotel Kämp. 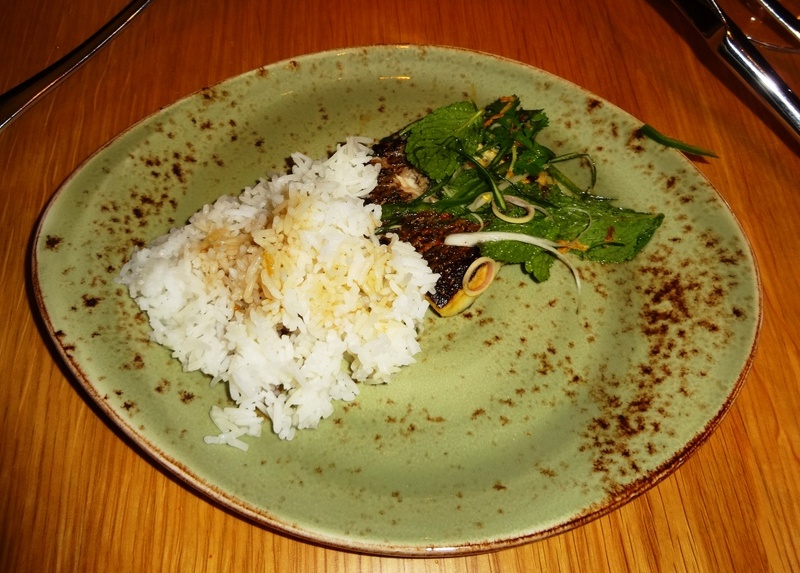 Inspired by the Jack Yoss Experience pop up restaurant which was at Yume in July 2012, restaurant’s menu changed and offers today a wide variety of modern Asian food. 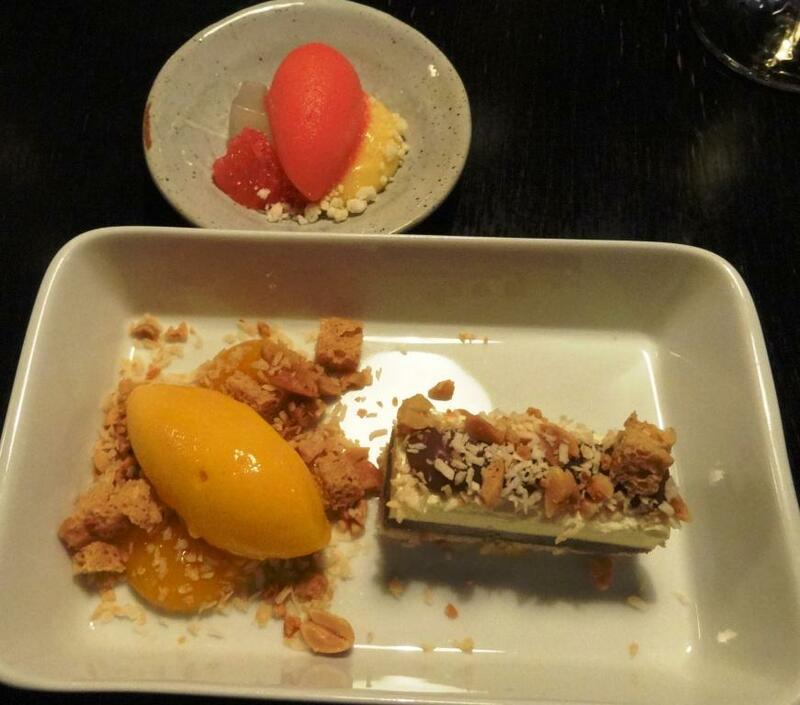 Our first visit was in February when we enjoyed tasting menu. This time decided to try dishes on the a la carte list. 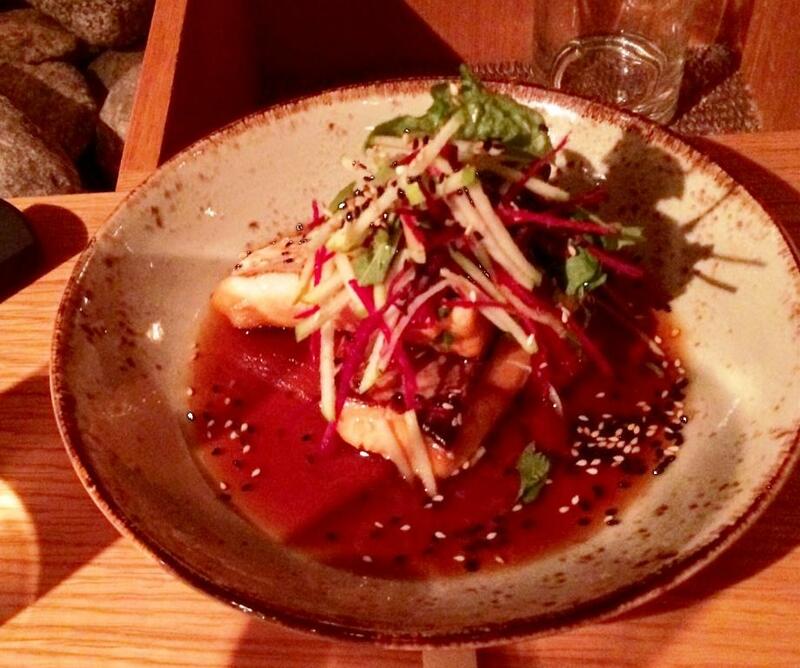 Unfortunately whitefish was not there anymore; it was the best dish last time from the menu. Before ordering food had to relax with aperitives. 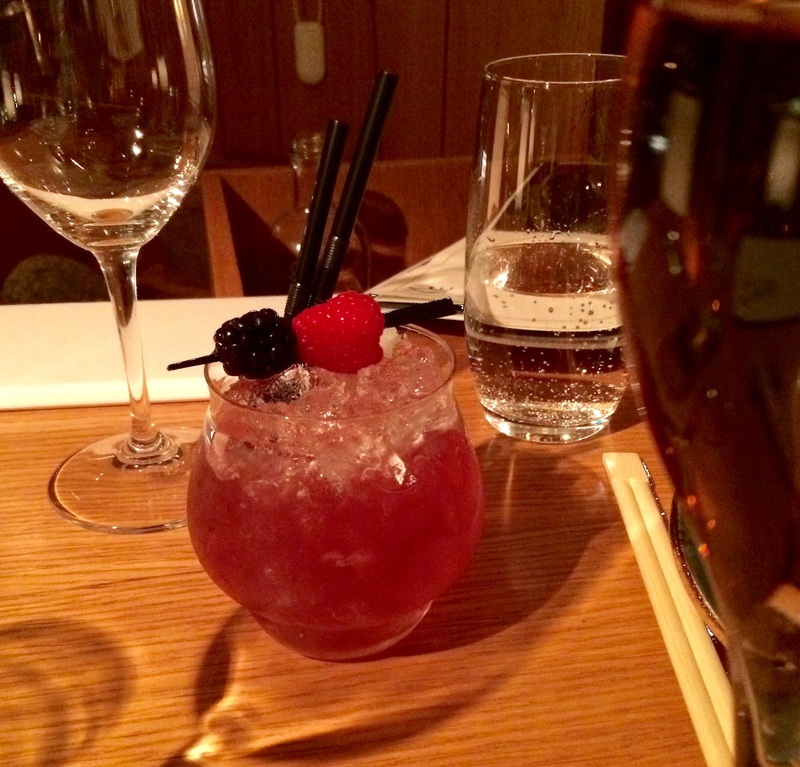 Chose Bramble Gin, bramble (blackberry) and lemon and Yume Roayl. With the amount of ice, Bramble drink almost dissappeared, but it was excellent apritif to start with. Royal included some herb, can not remember anymore which one. You could not notice bouquet of herb but the taste yes. 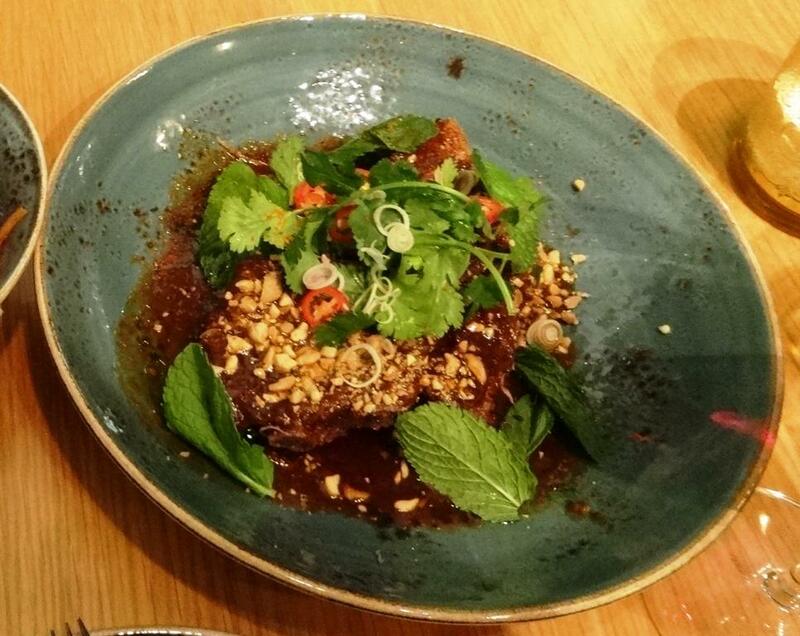 For starters we ordered Thai pork ribs Pork ribs, herb salad and thai-chili sauce and Whitefish Kinilaw Whitefish, lime and chili. Portion of ribs was huge and propably idea was to share it. But after tasting, I think no-one wants to share it. 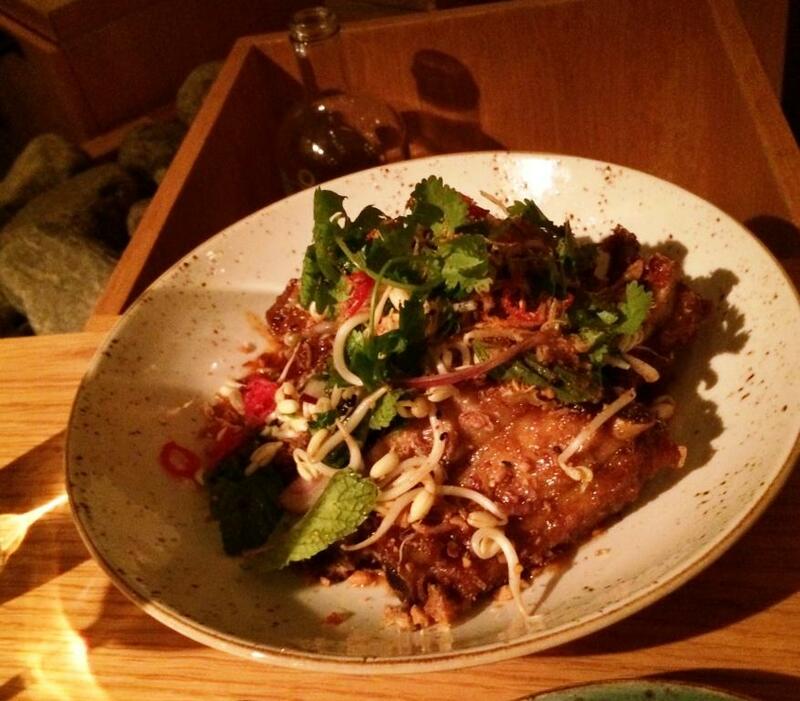 One of the best pork ribs dishes ever eaten. Last time one tiny setback was that food was not so spicy as we would like it to be, especially Asian. Now everything was in harmony including herbs, chili and sweetnes; perfect combination. And no grease at all around bones. Whitefish was marinated with lime and it was partially raw matured. You must like lots of citrus taste and of course chili, if you order this. Lavaret or whitefish is one of the best Finnish fishes to prepare like this. For main courses we had Cod and Crispy Noodles Fried cod, noodles and spicy ginger sauce and Salmon Teriyaki Roasted salmon and sweet teriayki sauce. Cod is excellent fish, a little bit under valued. If there had been less deep frying, this portion would have been really delicious. Dish was fine tuned due to our request and sauce was luscious. Unfortunately salmon was a little bit over roasted but side dishes, thai salad and sauce, matched brilliantly with the fish. For wine we chose Weingut Weegmüller, Riesling Trocken 2012, Pfalz, Germany. Nice basic riesling, not so typical size, 1 liter. 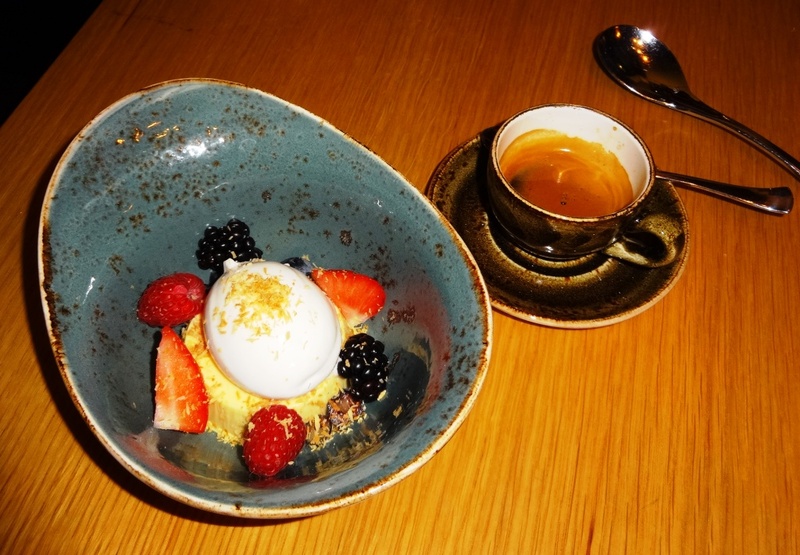 As starters and main courses were quite heavy, we settled for espresso and tea. 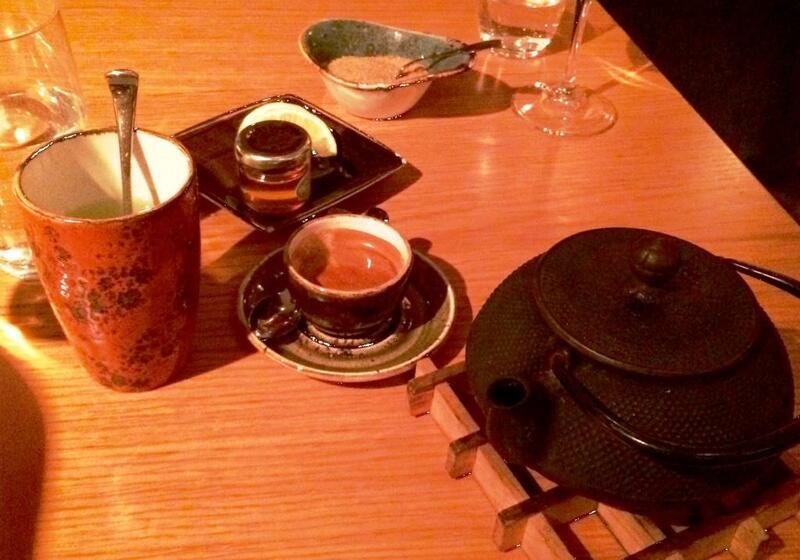 Tea pot was matching with Yume style. 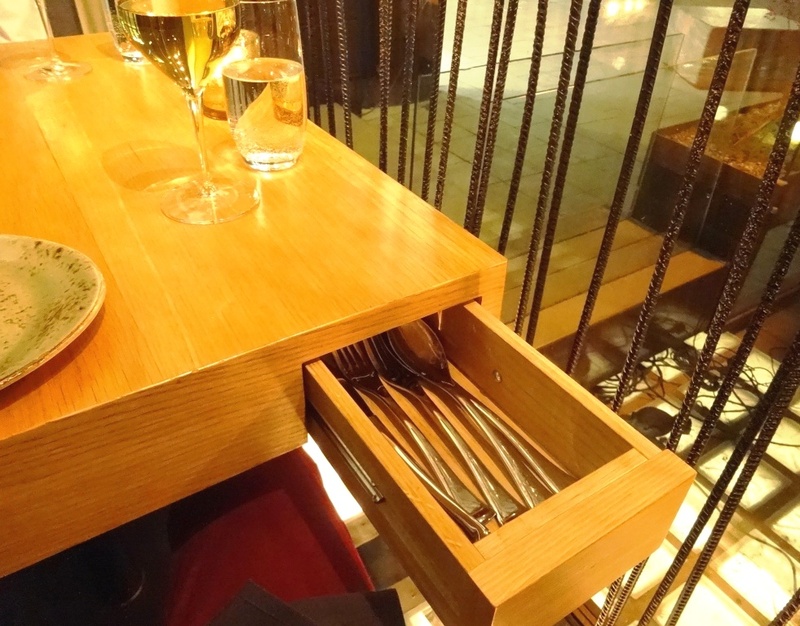 Interesting detail is the location of extra cutlery. They were hidden in a small box under the table, but only on one side. 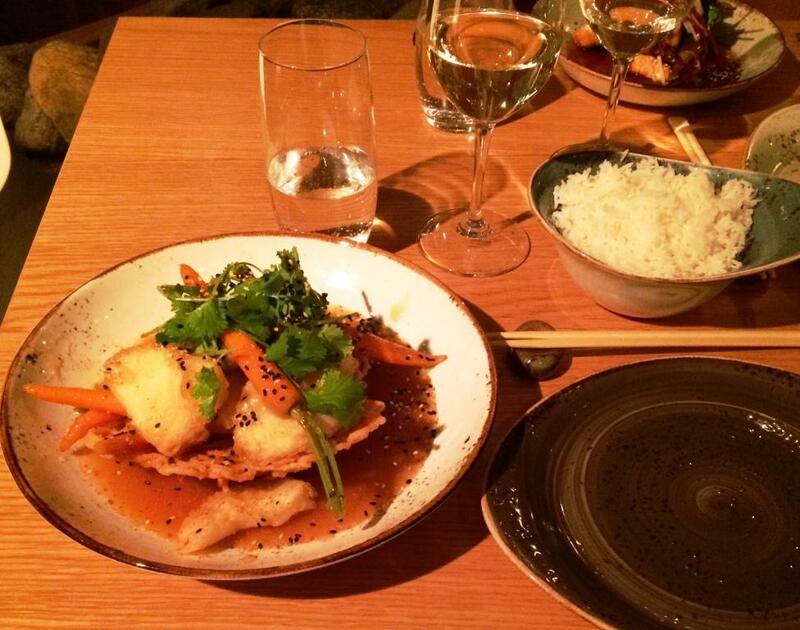 Yume is one of the best “gourmet” Asian cuisine restaurants in Helsinki. As it is in the center of the city, next door to Hotel Kämp, it’s location is also perfect. Would have liked to give 4 1/2 for food, but main courses are most important part of dinner. Clear improvement was more use of spices, herbs and chili. Modern rhythm music is not too loud and most of the tables are not thick on the ground, which makes discussion possible. Service was again professional as expected. Next time, which will definately come, we shall try Hot Stone dishes. 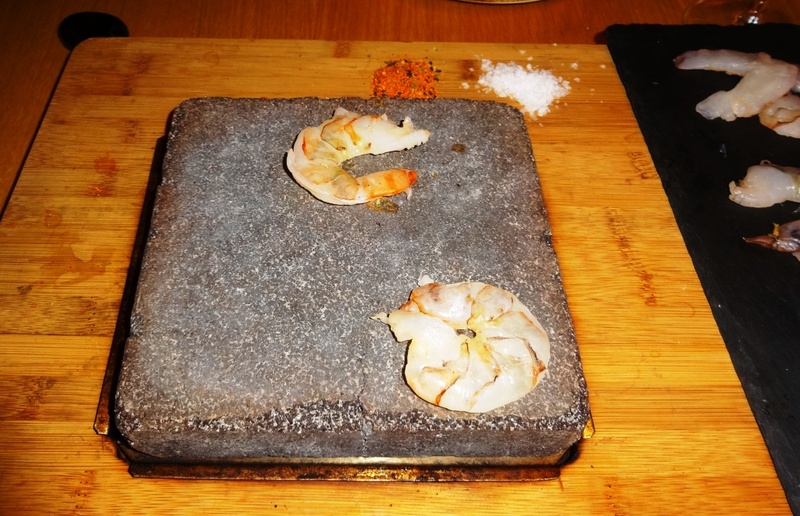 Scent in the restaurant is attractive due to several sizzling stones on the tables. It is not disruptive at all, which may be the case in some restaurants with the same idea.